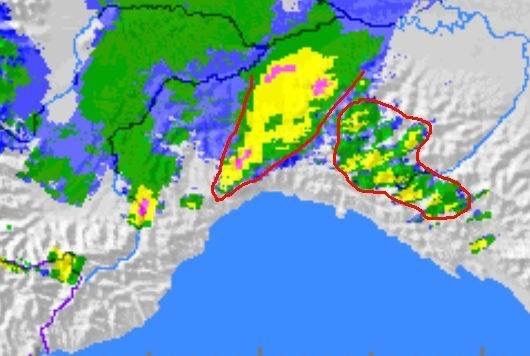 Other than 20 minutes of torrential rain, gusty winds as well as thunder and lightning yesterday evening, the Cinque Terre passed a rather uneventful weekend despite being under a level 2 alert. Special safety measures were taken over the weekend including the closure of all of the trails within the Cinque Terre National Park. Plees were made by local officials asking visitors to avoid the villages of Vernazza and Monterosso (the two villages that were affected by the October 25, 2011 flood), as they are still considered to be vulnerable to flooding. Now that the storm warning has expired we can all breathe a little easier. What a relief. Thanks to everyone who had our area and its residents in their thoughts. Hi there! The current situation with the trails is exactly like my other post on the status of the coastal trail. 🙂 Just keep in mind that if it rains the national park will declare all of the trails closed (as it’s a liability issue). The weather here is currently gorgeous and perfect for hiking! Next Next post: What’s the deal with the Cinque Terre Card?